The recent “hip-hop ban” of January 2018 revealed to the general public the mechanisms of State cultural governance in contemporary China, as well as the creativity of underground and independent Chinese music. 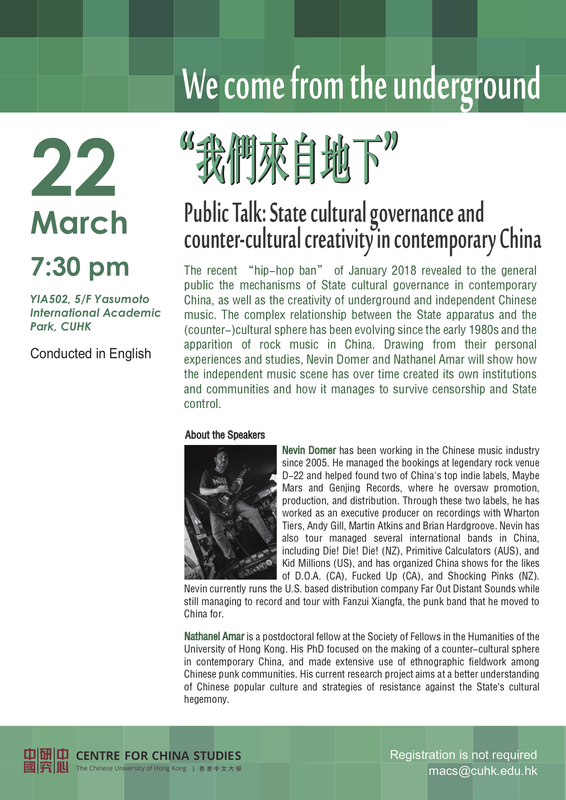 The complex relationship between the State apparatus and the (counter-)cultural sphere has been evolving since the early 1980s and the apparition of rock music in China. Drawing from their personal experiences and studies, Nevin Domer and Nathanel Amar will show how the independent music scene has over time created its own institutions and communities and how it manages to survive censorship and State control. Nevin Domer has been working in the Chinese music industry since 2005. He managed the bookings at legendary rock venue D-22 and helped found two of China’s top indie labels, Maybe Mars and Genjing Records, where he oversaw promotion, production, and distribution. Through these two labels, he has worked as an executive producer on recordings with Wharton Tiers, Andy Gill, Martin Atkins and Brian Hardgroove. Nevin has also tour managed several international bands in China, including Die! Die! Die! (NZ), Primitive Calculators (AUS), and Kid Millions (US), and has organized China shows for the likes of D.O.A. (CA), Fucked Up (CA), and Shocking Pinks (NZ). Nevin currently runs the U.S. based distribution company Far Out Distant Sounds while still managing to record and tour with Fanzui Xiangfa, the punk band that he moved to China for. Nathanel Amar is a postdoctoral fellow at the Society of Fellows in the Humanities of the University of Hong Kong. His PhD focused on the making of a counter-cultural sphere in contemporary China, and made extensive use of ethnographic fieldwork among Chinese punk communities. His current research project aims at a better understanding of Chinese popular culture and strategies of resistance against the State’s cultural hegemony.